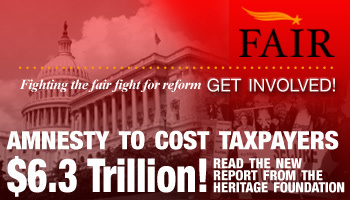 Amnesty will cost Americans $6.3 trillion. Rep. Mario Diaz-Balart (R-FL) told Roll Call that Congress must act on immigration reform before August or it doesn’t happen this year. The deadline to pass immigration overhaul legislation is this August, said Rep. Mario Diaz-Balart, R-Fla., who is part of the effort to develop an immigration bill that could pass the House. Diaz-Balart told CQ Roll Call in April that lawmakers had developed a policy that would adequately address concerns about border security and the 11 million undocumented immigrants.